When asked which application we thought most needed a makeover, our immediate thought was Via Rail. We use this app all the time to keep track of trips, upcoming trains etc. It's interface is confusing and you need to play with it a few times in order to understand what different components mean. There are areas where content is unclear or buttons don't do what you expect them to do. 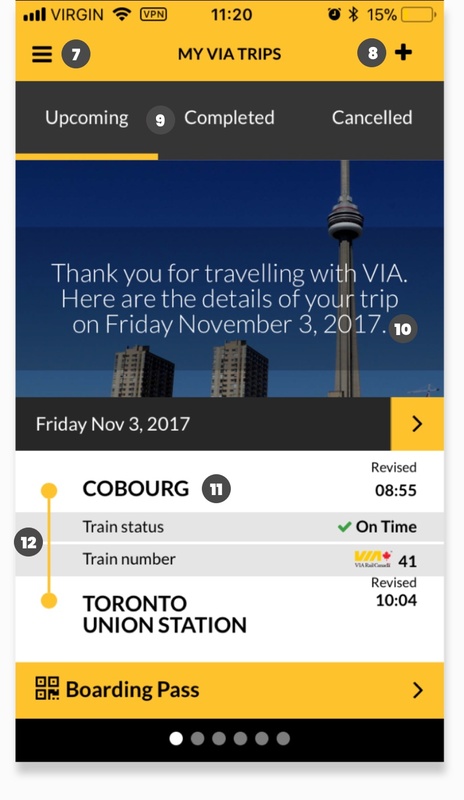 It's for all of these reasons that we thought the Via Rail app could use a makeover. We started by conducting a heuristic evaluation on the current Via Rail App in hopes that it would show us exactly what areas of the app need work to improve usability. 1 Added titles above text inputs with helper text inside. 2 Created a way for users to retrieve username. 3 Used just one logo, large, centered and easy to read. 6 Rephrased "Create profile" to "Create account"
7 Made "Create account" call-to-action button while maintaining noticeablity for the "Sign In" button by using the accent yellow and placing it on the right. 9 Created a navigation bar along the bottom. 10 Made all upcoming tickets available by scrolling. 11 Rearranged hierarchy of information by prioritizing train destinations and departures as well as times. 13 Made QR code readily available for quick and easy boarding. 14 Added simple account information for passengers to quickly look over their membership status and point collection. 15 Rephrased "Get your trip and boarding pass" to "Add a booked trip". 16 Removed "+" button and pop-up function by moving "Add booked trip" section to home screen. 17 Changed helper text from "add" to confirmation number example. 18 Added a "what's this?" button for further information.